I am using Win10. Apparently some ransomware hacking attacks can corrupt any attached USB etc drives, so I wish to remove the My Passport backup drive when not actively in use. As far as I knew, no relevant programmes were being run. I went to Task Manager and ended the 3 WD tasks listed. After this when trying to do the eject, I still get the same error message. How do I safely remove the USB My Passport after a backup? Since you have Windows 10 I suggest asking this, eject usb drive in windows 10, in the search box. You will get several results, such as this one. Save and close all open files from the USB flash drive. Save the file or files you are working on in your USB flash drive, and then close all open files in your flash drive. Wait a minute or two for your computer to finish writing data on your flash drive. Some flash drives have light indicators. See example images below from my computer. A message should come up in this same area when it is safe to remove the device. I get this issue all the time, too, and it doesn’t matter what brand the drive is. It’s a process on your computer that’s accessing the drive, and refuses to relinquish file handles even when the OS tells it to do so. Programs such as antivirus, search indexers, etc are notorious for this. In many cases, I have to resort to shutting down the PC to remove the drive. Thank you. I have also resorted to closing down my PC to solve the problem. Will removing the drive in defiance of the warning cause damage? In view of this problem, should WD provide a routine to close down its activities at the end of the backup process, as seen by Win10? It certainly can… WD can’t provide any workaround for an OS-level shortcoming. WD can’t force another program to stop what it’s doing. The problem does not normally occur with other USB memory devices, so the problem occurs because of the way this WD program interacts with OS. Presumably WD could monitor the processes that are started as a result of its program, then reset to their starting point them at the end. Alternatively, or in addition, WD could negotiate with Microsoft to fix the underlying incompatibility. Find out what files, registry keys and other objects processes have open, which DLLs they have loaded, and more. … see if that helps. In the CONTROL PANEL go to HARDWARE AND SOUNDS then go to DEVICE MANAGEMENT. Look for the DISK DEVICES. UNINSTALL the device you are unable to “safely remove”. I´ve restarted the computer but I do not think it is necessary. I´ve plugged and ejected the drive several times. Tested it with other drive I had the same problem but was a Seagate as well. Worked fine all the times. I am using Windows 7, but it should work to other versions as well. I´ll post it on the other sites so people can easily find this. Hope it helps more people. I tried updating all my drivers, checking for new drivers for this device - there were no new drivers. So I created a system Restore point before I tried Newtonu’s method - I would encourage all users who try this method to do so just in-case. So I uninstalled the device and… Success! I was able to safely remove the device on the first try. Restarting the computer is a good idea, I didn’t before I disconnected the device but I did afterward just to be safe. Thanks a bunch to Newtonu! I made an account on here to specifically THANK YOU for your advice. I’ve tried everything imaginable and searched for hours on end to try to safely eject my easystore without having to restart my laptop! I eventually gave up and didn’t want to risk erasing everything on my drive again (yes AGAIN), but I felt a whim today to look for solutions and saw your comment. THANK YOU SO MUCH. I’ve tested it a few times myself to make sure nothing was damaged and everything is perfectly fine. Thank you again so much!!! I found an easy solution to this problem. I uninstalled the WD programs and then it was able to be ejected without any issue. I had 2 WD programs installed (WD Discovery and WD Utilities) on my Win10 laptop. So normally I’d read the solution and move on, but I’ve found something better for this problem and wanted to share it. 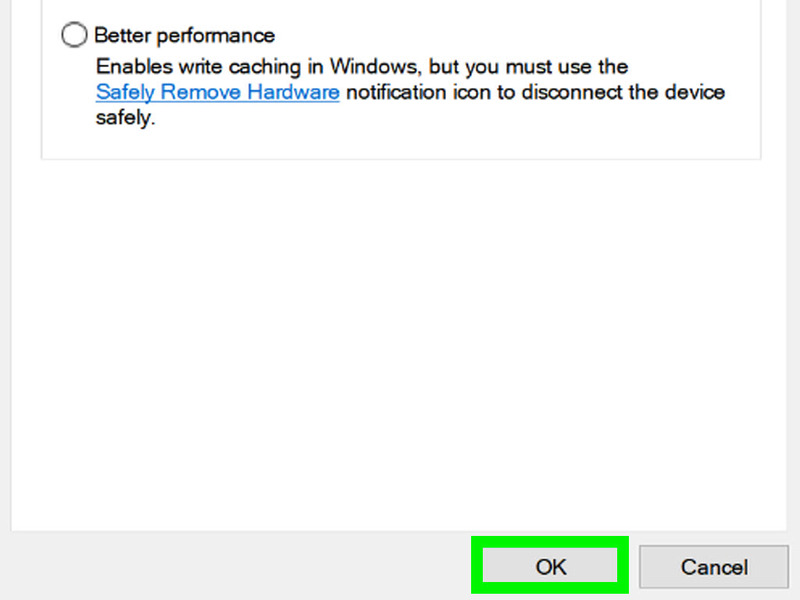 Disables write caching on the device and in Windows, but you can disconnect the device safely without using the Safely Remove Hardware notification icon. Enables write caching in Windows, but you must use the Safely Remove Hardware notification icon to disconnect the device safely. The default is Quick Removal in my case so I can just rip it out at will.